How many times have you been building a track and been able to vocalise the sound you want but have then been stumped when trying to find a similar sample? If you’re anything like this news editor, it’s a bunch. 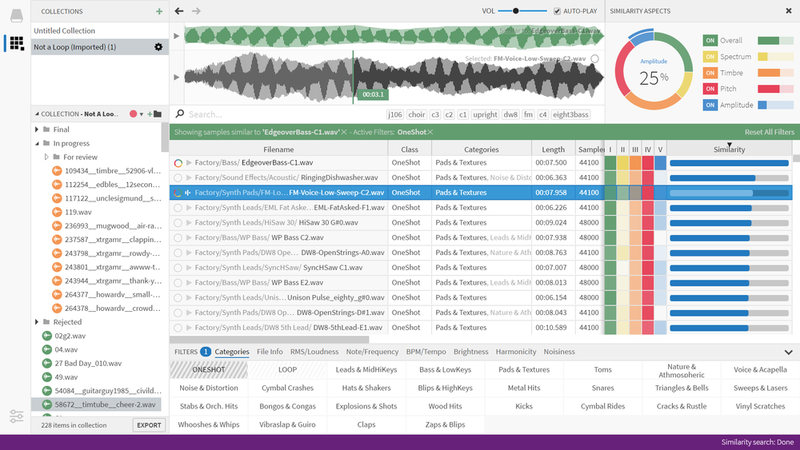 Sononym are seeking to resolve this, and other sample management problems with their sample browser. With the aim of making your samples more searchable, Sononym is powered by machine learning that analyses your samples and automatically tags them. What’s really clever here is the way that it groups them — based on what they sound like. That’s to say, they’re automatically split into loops and specific kinds of one-shots such as hi-hats, kicks, pads, leads etc. But, as mentioned, perhaps the most exciting feature is Sononym’s ability to find samples that sound similar. By analysing each sample using five metrics: Overall, Spectrum, Timbre, Pitch and Amplitude, Sononym is able to return sounds that are like to an imported sample, ranked by similarity. You can even record yourself doing your best impression of a hi-hat or explosion, for example, and find similar sounds for substitution within your project. Sononym offer a free, fully functional 30-day trial which works on Windows 7,8 and 10, MacOS 10.9 and newer and Linux. A full license costs €89/$99.